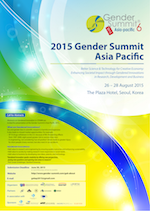 The aim of the Gender Summit 6 Asia-Pacific 2015 was to introduce compelling research evidence on benefits of addressing gender issues in science and technology to improve quality of research and innovation. The Summit connected relevant stakeholders to develop strategies on how discussions and technological collaborations on gender diversity can open up opportunities to create new markets for scientific research and innovations. contribute to enhancing quality of life by connecting gender issues and the best available technology based on distinct characteristics of Asia Pacific. Organised by: NRF (National Research Foundation of Korea), KISTEP (Korea Institute of Science and Technology Evaluation and Planning), WISET (Center for Women in Science, Engineering and Technology). Read more about the GS6 Partners and Convenors. WISET Gender-Forum Report The Role of Gender-based Innovations for the UN Sustainable Development Goals What are our next Steps in Korea?